The Elite Crimson Overnight Clinic is designed for the serious and advanced field lacrosse player as well as goalies who want to compete at the collegiate level. This intensive three-day event will focus on higher level skills and strategies for shooting, offensive motion, defensive techniques and team play. Game-like situations and drills will be used to put these techniques into practice. Campers are divided by age and skill level to provide the appropriate learning environment. Each player is given a numbered reversible and every college coach is given a roster providing each player’s information. Instruction and attention from college goalie coaches and collegiate goalies. Individual goalkeeper stations will focus on save techniques, positioning in cage, footwork, hand speed and out-of-cage play. All goalies will meet for group sessions during camp to provide a focused skill session. Goalies receive live field experience to encourage implementation of skills learned as well as to encourage communication and team-defense technique. All Resident campers will be housed in the dormitories at the Harvard Business School. All rooms are air-conditioned and are single occupancy. You may request to be placed near a friend. All housing requests must be submitted at the time of online registration. Meals will be enjoyed in both the dining halls and are also provided by local catering. Commuters receive Monday Dinner and Tuesday lunch and dinner on campus with all campers. Our dining halls feeds the entire Harvard student body and accommodates food allergy restrictions and gluten free options. Please email devon@willslax.com with any dietary concerns at least three days prior to the camp. We will be using the iconic Harvard Stadium and Mignone Rugby Field. Fields are closely located to each other as well as to Harvard Business School. Our camps allow the athlete to experience the feel of being a student athlete on Harvard’s beautiful campus. 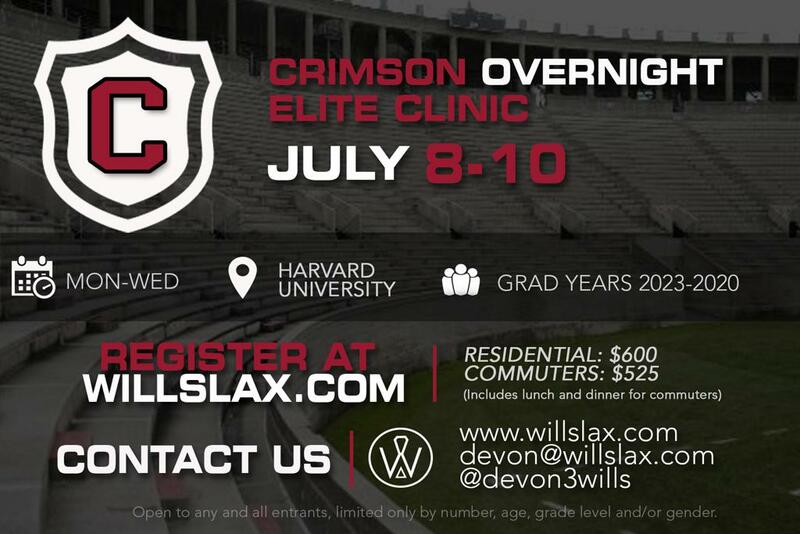 The 2019 Elite Crimson Overnight Clinic will include the entire Harvard Women’s Lacrosse Coaches and Staff. Additionally, we commit to bring in D1 College Coaches as well as US National Team Members for camp instruction and to provide unparalleled insight as to what it takes to compete at the highest level. All Campers will receive a Confirmation Email once registration and payment are processed. Campers will also receive an information email one week prior to camp which will include an attached Information sheet, directions, tentative schedule, and what to bring. *Please read the ENTIRE email for important information. Medical/Waiver information will be completed during the online camp registration. All campers, including commuters, will check in between 12-2pm on July 8thon the Harvard Business School Campus. Specific directions will be sent closer to camp start date. Overnight Campers: 1:00-2:00pm from the Dormitory unless arrangements are made for check out with a camp director from the Field. *Schedule flights for 3:30 or later if possible or player may leave from the fields. We will accommodate your flight times. Campers may fly into Boston Logan Airport (BOS). Ground shuttle transportation is not provided by the camp. Please contact a shuttle service directly to set up pick up and drop off. There is a 50% non-refundable fee if cancellation occurs for any reason. After July 1st, no refund will be made unless due to medical condition or illness. For medical refunds: A doctor's note must be provided within 7 days of camp starting date. We will apply the balance of tuition (less the 50% non-refundable fee) towards a future camp. Balances and deposits are transferable to siblings or family members ONLY. There are NO REFUNDS if cancellation occurs within 48 hours of camp start date.